It is not hard to imagine the flying firebrands being launched from the top of Makana and floating out over the sea, where people in canoes would watch and try to catch them. "Those of chiefly blood were trained in classes exclusively for chiefs. Their graduation ceremonies were elaborate and imposing. About ten days (anahulu) were devoted to feasting, hula, and the chanting of their name songs by the beautifully wreathed chiefly graduates. 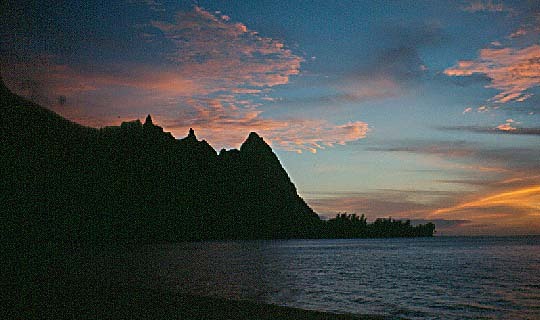 End to end of Kaua'i,especially from the home districts of the students, would come their families and their hosts of relatives and friends, to lay before them heaps of food and other gifts. Canoes would swarm in the bay and crowd the beach at Ha'ena. In special honor of the chiefly graduates would be held glorious exhibitions of fire throwing, from the towering cliff of the 1590-feet high hill of Makana, at Ha'ena. 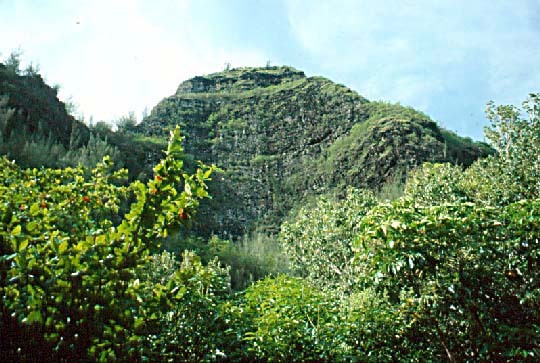 And also the celebrated fire-throwing cliff of Ka Maile (or Ka Pali O Ahi o Kamaile), 2500 feet in height, at Nualolo. "Far less pretentious were the hula graduations of classes of commoners composed of commoners exclusively. Feasting and hula would be enjoyed for about ten days, their fire throwing, if any, was limited to the local cliff of Makana only. "Nowhere was fire-throwing more popular than on the island of Kaua'i. There it was the spectacular sport of kings and chiefs on outstanding occasions. Blazing shafts of light wood, hau and papala, dried from six to eight months, would be cast seaward from the heights to be born about by the wind, presenting brilliant displays." Papala was the favorite wood for fire throwing. Chipper explains that this plant is not to be confused with the papala kepau, which is different. "Papala is in the amaranth family, produces a very light, flammable wood when its dry, and has a hollow pith, a hollow core, so they said that often they would just light one end and throw it like a spear, and the flames would travel through the hollow core and out the back, and would look like a jet rocket flying through the night. Other times, they would throw it so it would tumble, and would look like a fireball tumbling off the cliff. Must have been incredible to see that!" Beatrice H. Kraus, in her work "Plants in Hawaiian Culture" (1993: 95-6) writes that o ahi was a sport carried on during certain times of the year when strong winds swept out to sea from the high cliffs on the Na Pali coast on Kauai. She adds that "Some of the embers dropped into the sea; others were intercepted by some of the spectators in canoes in the sea below the cliffs and used to brand themselves as a form of tattooing to commemorate the occasion." The scooped out side of Makana mountain would indeed work like a chimney, channeling air vertically. This made good conditions for firebrand-throwing, but dangerous conditions for getting up there. Samson told us a little about trying to recreate fire throwing back in the 1980s. First of all, he said, "I went looking for the papala wood. Well, it might have been common a hundred years ago, but you think I could find any now?" Then, he said his mother warned him about the climb. "She said, you got to go a little, then stop, wait, because of the wind." In the end, he did not go through with it. Chipper affirms that "It's a critical climb up there, really critical. It was definitely a life and death climb to get up there, it wasn't for the faint-hearted. Tradition had it that they would come back down the next morning after it became light. But who knows? It wouldn't have been too comfortable of a place. The cliff is such that the wind just whistles right up the face. And if you step back a little ways from the front, you're kind of in the lee of it, it's not too bad. There's nobody left alive that has any first-hand knowledge of that at this point." The last known occasion of fire-throwing occurred in celebration of the visit of Queen Emma. Why did they stop? Chipper suggests that "For their ali'i, they did it. When Queen Emma came, they did it. Samson's father or grandfather was in the last bunch that did that. It was considered a very sacred ceremony, not something that was done just for the heck of it, so maybe as the ceremonial function began to cease, along with that, a lot of the motivation. "That whole relationship between the people, and their gods, and their chiefs, changed so rapidly. The Kamehamehas were able to maintain that kind of reverence from their people, but after the fall of the monarchy, it was a whole new world out there in terms of what's important. As they say, aloha died and cash took over. " Fire-throwing figures in the story of Nou, one of many landmarks and storied places in Ha'ena ahupua'a. You can read about it in the Footprints chapter.